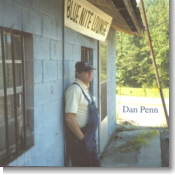 One of the most prolific songwriters on the golden era of soul music, Dan Penn, does a collection of his new compositions on an excellent independent release, Blue Nite Lounge, featured as this month's Pick Hit. He sings like Big Joe Turner and plays guitar like T-Bone Walker. Could that sound really come from a 22-year-old from Texas? Check out Nick Curran's excellent new album in the February Surprise feature. Alligator Records pays tribute to two of their better-known blues rockers, Johnny Winter and the late Roy Buchanan, in their continuing Deluxe Edition series. These CDs are covered in this month's Flashback selection. This month's What's New section features reviews of new CDs from Max Weinberg 7, Zora Young, Little Milton, Wallace Coleman, Sue Foley, Cyril Neville, Phil Upchurch, and more.